The chart above shows the percent change in U.S. traffic volume through July (from the same month in the previous year), in a report released today by the Federal Highway Adminstration (data and report here). After falling for 17 consecutive months starting in November 2007, traffic volume has increased in three of the last four months. 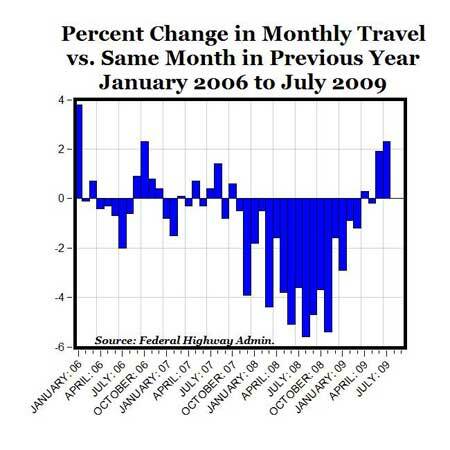 The 2.3% July increase was the largest monthly gain since January 2006, and matches the 2.3% increase in October 2006. 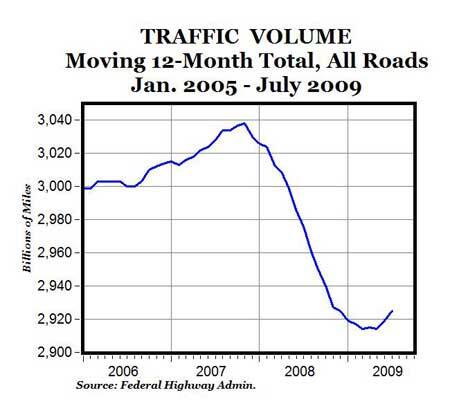 The chart below shows traffic volume as a moving 12-month total, with a similar pattern to the percentage monthly increase above. After falling for 16 straight months going back to December 2007, the moving 12-month total has now increased in 3 out of the last 4 months to the highest level since last year. MP: Another sign that the recession probably ended in June.